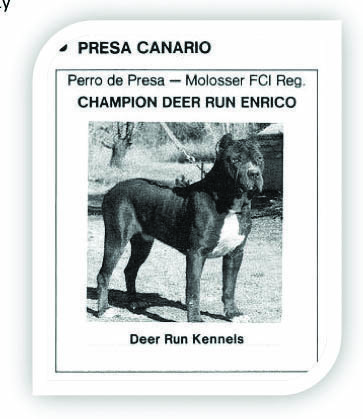 While accusations of crossbreeding in his Mastiffs dogged Tobin Jackson of Deer Run Kennels, his efforts in breeding Presa Canarios in the late 1980s and early 1990s generated just as much controversy. Miguel Angel Sanchez, who spent five years with Jackson after he arrived in Mexico in 1995, said he queried Jackson about the origins of his Presa Canarios. Deer Run Enrico, one of the Presa Canarios Jackson took to Mexico with him. According to Sanchez, Jackson brought four Presas to Mexico with him – two males and two females, among them Deer Run Enrico. By then, Jackson had sold his most influential Presa Canario, Deer Run Arbaco. The foundation for many early American-based Presa lines today, Arbaco is the first Presa Canario registered with the American Kennel Club’s Foundation Stock Service (FSS). Tracy Hennings of Cleveland, Ohio, past president of the Dogo Canario Club of America, says that while Arbaco has been described as a “gray brindle,” he was in fact blue – a color that she says does not exist in the Canary Islands, though it is common in Neapolitan Mastiffs, a breed that Jackson had at Deer Run in later years. What’s the truth in the Presa brouhaha? Arbaco is long gone, as is Jackson, and along with them any hopes of definitive answers. And the Presa world, arguably even more divided than the Mastiff one, is left to hash out the knotty question of who is a bona-fide Presa – and who is not.